On Friday night I went to the wedding reception of a friend from junior high's brother. Junior high. Oh man. Those were the days. Drama, drama, drama. But, here's proof that every cloud has a silver lining. 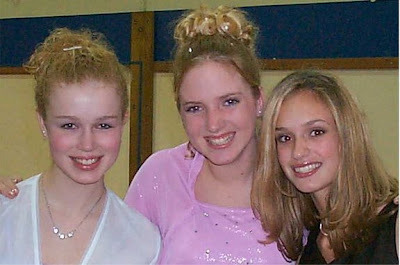 Here's me and Erin and Michaela at our junior high graduation back in 2000. Here's me and Megan at a Valentine's dance also back in the early 2000's. And here's me, Erin and Megan, 10 or so years later, still friends. I love keeping in touch with such fantastic people. Last Saturday we bought a mattress which they said they would order and deliver in about a week. On Friday they called to tell us they couldn't deliver it until the NEXT Friday so we said forget it, we'll come get it ourselves. So we did. I hunched over and looked out the window while driving to make sure the mattress and box spring stayed put while on the freeway. Now if you'll excuse me, I'm off to see The Sounds, Paramore and No Doubt!